It was totally brilliant. You know how I like to golf after all. 10 seconds after we drove away from the house we were giggling like hyenas and congratulating ourselves on our fabulous plan. I knew Janel was a golfer and so when I saw her golf gear I wasn't surprised. 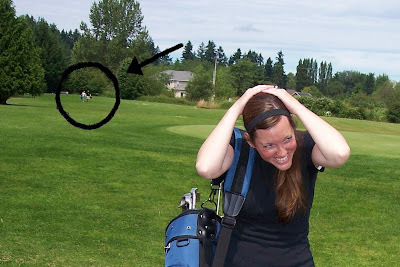 I was surprised however, when as I was lumbering behind her, the contraption that holds the bag up fell off piece by piece before we even got to the club house. We collected the pieces of my bag and ditched them, then went along our way, happy and only mildly embarrassed (me) when missing the ball completely here and there. At approximately 186,282 miles per second, or the speed of light. Actually, no. That would be giving the negligent golfer who hit me too much credit. You see, if he said "fore" it was not loud. And after hitting me he went ahead and took another shot, so clearly he knew he had gone rogue with the first one. And then he didn't even come to see if I was okay or anything. Luckily I had Janel on my side who told the guy off after we waited for him to catch up with us. Meanwhile I was definitely not crying. Even a little bit. It was allergies. It was just so shocking to feel my leg spontaneously combust as I strolled along discussing important matters with Janel, like how much we hated the weather. I felt it was appropriate to duck in the picture. Anyway, I'm glad it wasn't my head, so that's good. We continued along our lovely lady date and I am now sporting the proof of my experience. Honestly, I was hoping it would look worse. In a totally unrelated yet oddly similar experience, I was outside rescuing a frog from death via impending lawnmower when an eggshell fell from the sky and landed in the grass next to me. I'm not sure whether to buy a lotto ticket or build a bomb shelter. As soon as I saw the title of your post, I knew it would require a comment from me! First of all, I haven't thought of that song in literally years, and second of all, it totally reminds me of you! I love you girlie. And I can't stop laughing. Funny thing: I was really hoping you'd post a picture of the damage to your leg! I'm glad my curiosity was appeased. Dang golfer. He should be smacked. Flying eggshells to boot! Holy smokes. I hope the pain and anguish was worth it. I had a ball.